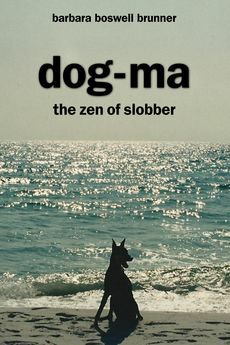 I am working on an art project tonight, but wanted to leave you with this author interview with Barbara Brunner Boswell, author of Dog-Ma: The Zen of Slobber. I reviewed Barbara's book last week and decided to ask her if we could do a Q & A about memoirs, writing and dog books. I started this trend a couple of weeks ago when I interviewed Barbara Techel, author of Through Frankie's Eyes, and hope to talk to other memoirists and authors of dog books in the future. I hope you enjoy reading Barbara's answers as much as I did. Q: Barbara, I really enjoyed your book. I am wondering if you could let readers of this blog know what led you to write it? My initial inspiration was the grief I suffered at the loss of our first dog, Kashi. I started writing the book in my head almost twenty years before putting pen to paper. I took a break from my work life when I was diagnosed with breast cancer. I sold my business; worked on getting well and found myself ready to finally start writing my little story. Dog-Ma was inspired by my love of dogs and the need to get all of the crazy stories we had been telling at cocktail parties for decades down on paper before senility sets in and I forget them. Q: Why do you feel memoirs featuring dogs are so popular? Anyone who loves dogs will relate to someone else’s dog stories. All dogs do crazy things and I think readers like to learn that they are not alone in that craziness. Discovery that their own dogs may not be the nuttiest ones on earth is comforting. Anyone who has lost a furry companion to old age, disease or accidents can empathize with the grief others feel and perhaps gain some closure. And, who doesn’t love a funny dog tale? Q: I teach memoir writing at a small community college and many of my students would like to write a book but are uncertain where to start? Can you give them any advice? This one is a hard question to answer because memoirs are so personal. I suppose that to write a memoir you must be passionate about your life and the message you want the memoir to convey. Find the most important central message and use it as a starting point. I was given a piece of advice early in my writing from a bestselling author. She said to write a poignant memoir; you must start in the middle and work outwards. For me, that made complete sense. If you start at the beginning, it may be hard to grab your reader’s attention. Define the message and then tell your story. A publisher told me that a memoir should never be told in chronological order. Yea, I threw that piece of advice out the door! Q: What led you to choose the publishing route that you did? I am very impatient. I knew that if I queried and followed the traditional route my chances of publishing were slim. My father was suffering from congestive heart failure and I wanted to get my book in print before he passed away. He was my mentor, guide and inspired my love of books and dogs. He was so proud of Dog-Ma and enjoyed showing it off to all of his friends and neighbors. As it turns out, I published in August of 2012 and he passed away on New Year’s Eve 2012. Dog-Ma may or may not get discovered by a big publishing house. It is currently on the desk of a New York literary agent, not in his slush pile, so good things may happen, yet. None of that really matters in the big picture. I made my dad proud and to me, that is all that counts. Q: What has been the most rewarding aspect of writing this book? There are so many things that have been rewarding. The five star reviews I receive are satisfying and the people I meet at book signings are so much fun and I love to hear their personal dog struggles. The most rewarding thing, though, has been the other authors I have met through this process have become dear friends. Authors are such a supportive group. The advice and direction I have gained from them has been phenomenal. Getting over the fear of rejection and criticism was my greatest challenge. Being able to set those fears aside has allowed me to gain experience and knowledge that have greatly benefited the book. Q: Izzy is the last dog you mention getting in your book and when you left us, Izzy, a terrier was wreaking havoc and beating upon your much larger dog, Morgan. How is Izzy doing today? Izzy continues to think she can beat up Morgan. Morgan just sighs and walks away. I am always hopeful that they will one day wake up and be best friends, but reality says I am delusional. We had a photo shoot last week with Hannah Stonehouse Hudson for the cover of my next book. Izzy and Morgan were both such hams. I think they knew they had to “out-cute” each other to see who gets the cover. Sibling rivalry rules! One last thing I would like to share on the blog. As I said earlier, my dad was so proud of my book. When I had to pack up his apartment after he passed away I had help from several strangers who worked for the charity where I was donating all of his possessions. Someone else packed up his huge collection of books. Two weeks after I returned home to Florida I received this message on my Facebook author fan page. "Barbara, I am compelled to write to you.... as you will see... I was recently (last weekend) in Lancaster visiting family and friends and my sister in law took me for a fun afternoon of shopping at the thrift stores bargain hunting. I adore books and although I already had a full suitcase I found myself in buying a few. One of them was your Dog-Ma. I am a dog lover and couldn't resist your title. Finally this morning back here in Boca Raton Florida I opened the book to start reading, I noticed sticker on the front inside cover -a return address sticker presumably of the person who owned the book, I removed it... and then started reading. When I opened the book I saw it had been inscribed, "Dad, Love you! B" What? I thought, what was the name of on that mailing address sticker? Robert Boswell. I am now holding in my hand the book you gave to your father. I immediately went to find you on FB and I looked up and found on the web your father's recent obituary. I want to offer my deepest condolences. I also hope you don't mind me reaching out to you.... I feel a special connection to you. As a book and a dog lover..... wow. SO, I am reading the book now, with my Rottweiler, Shasta Pearl (2 years) old at my feet. I will cherish the book -for it's wisdom and stories of love and for it's special sentimental value- and if you are ever in Boca Raton...well... I just have to meet you." The writer of this message and I have become Facebook friends, chat daily and are meeting in person for the first time in a few days. Things happen for a reason and I cannot wait to see how this one plays out.